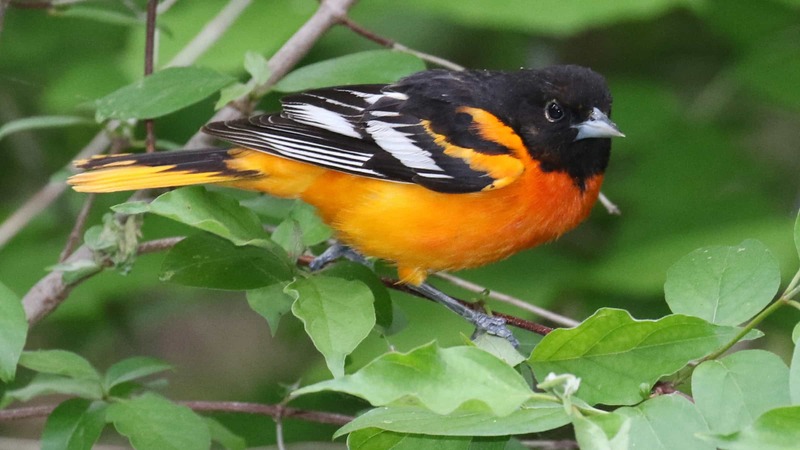 The state bird of Maryland, the Baltimore Oriole was named for royalty. It was given its name in honor of Lord Baltimore, founder of Maryland, due to its coloration. The colors of the Oriole match the colors of Lord Baltimore’s coat of arms. Not surprisingly, everyone wants to attract Baltimore Orioles to their yards. The best way to attract Orioles is through their stomachs. I set out fresh orange slices, but I also use grape jelly. I have found that it is best to use the least expensive jelly you can find and be consistent. If you switch to an expensive jelly, the birds don’t like to go back to the cheap stuff! It also helps to plant native fruit trees in your yard, preferably plants that bear dark-colored fruit at different seasons. I have several mulberry, raspberry, blackberry, chokecherry, and other native fruit-producing plants in my yard, so the Orioles tend to ignore the feeders once the fruits begin to ripen. Still I provide fresh oranges, jelly and clean water just in case they need an easy snack.